A true lily belongs to the group of flowering plants that are considered important, according to culture and literature. Their delicate beauty make them a must have flower in every garden or house. 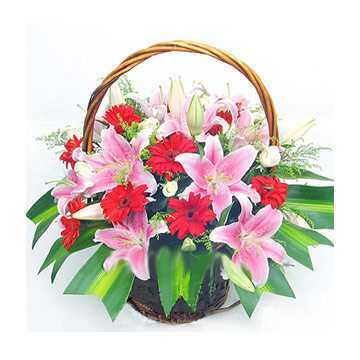 This bumper basket of 6 lilies and 8 gerberas adorned with fresh green leaves and seasonal fillers is a wonderful gift for your loved ones.